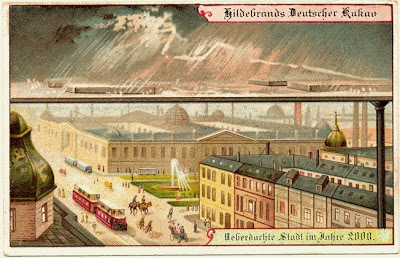 The future, according to Hildebrand’s Chocolates in 1900. When we look into the future, it’s always the same stuff that catches our fancy. Transportation, climate control, surmounting daily inconvenience. 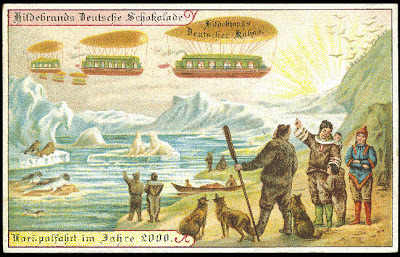 The postcards here show a light-hearted vision of life in the year 2000, as illustrated on chocolate boxes circa 1900. I’ve noticed, however, that older ‘future-visions’ from this era rarely include farming and food supply, maybe because basics of the food infrastructure either didn’t seem like something that needed to change, or it seemed like something unchanging. With the exception of mechanization, farming has been a life constant since human civilization began. 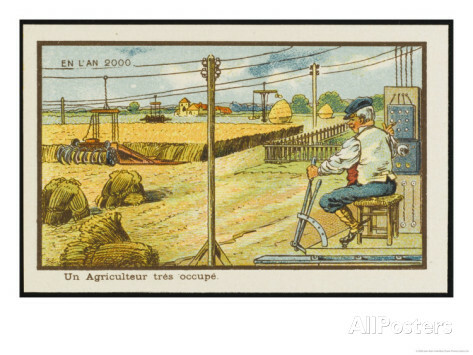 In the year 2000 – the busy farmer. Our current visions of the future almost always involve the increasingly knotty issue of food production and distribution. Where to grow, how to grow, the shortest distance between growers and consumers. Every conceivable urban space is imagined covered in agriculture, from building walls and roofs to the tops of buses. A group of entrepreneurial urban farmers have descended into the depths of London’s old WWII bunker system to test out underground farming. Using LED lights and hydroponic growing beds, the new Zero Carbon Food project is intended to create a city farm that is weather-independent, organic and carbon-neutral. The bunker extends over 2.5 ha (6 acres) and was originally a bomb shelter, a series of tunnels that could hold up to 8000 London residents. For the time being, the farming project is only using a small corner of the bunker, but the group hopes to expand. The temperature can be maintained at 20 C° (68 F°) for ideal growing, there are no pests (yet), and the water that is usually pumped out of the tunnels could be used to irrigate the farm. The creators say that farming underground negates seasonality, providing an environment that can be constantly controlled. 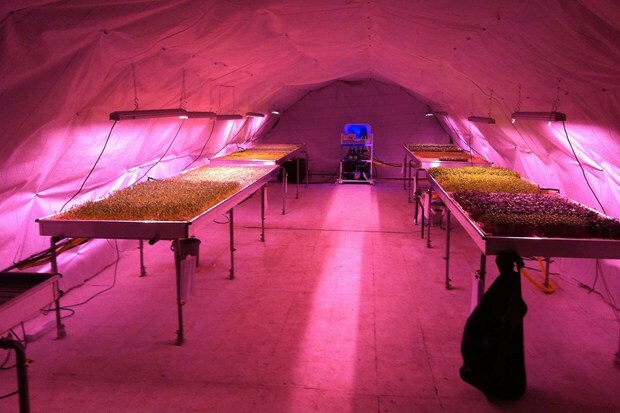 The underground test farm, lit by LED lights. An interesting notion, putting farms underground. Futuristic scenarios always seem to put the humans either underground, on water or in outer space once Earth’s surface becomes too volatile for our fragile needs. If we can envision farms on space stations, then certainly a London bunker farm seems entirely plausible. Vacationing at the North Pole. This one is seeming less far-fetched these days.